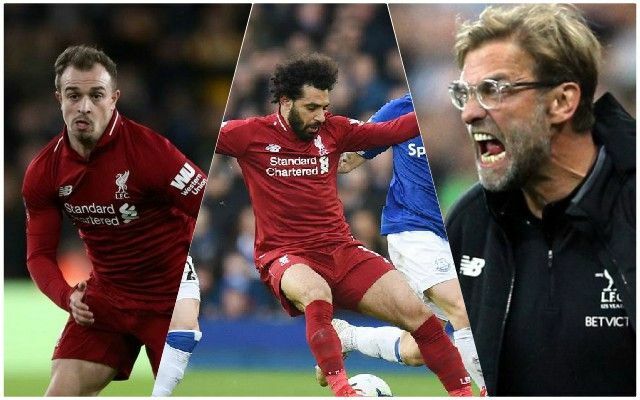 Reds boss Jurgen Klopp reacted angrily to questions over his team selection following the Merseyside derby, claiming some people think he can just throw on an extra attacker as if he’s playing on a games console. Liverpool have only lost once all season, but have now drawn seven times, placing the Reds a point behind Manchester City, who were fortunate to beat Bournemouth on Saturday. Many fans were annoyed at the decision to bring on Adam Lallana before Xherdan Shaqiri or Naby Keita against Everton, and the fact the steady and solid midfield that he favours in the big games, especially away from home, was retained. Via the Daily Express, when it was put to Klopp that he was too defensive, he said: “We don’t play Playstation. Do you think we didn’t take enough risks? That we should throw on an extra attacker just to go wild? We were offensive enough. The final nine matches will ultimately determine whether the boss got it right or not. Over the last few months, Klopp has made more than enough good decisions to warrant our trust – now is not the time for a meltdown – but three points yesterday would have made a big difference. All we can do now is get as many points on the board for the remainder of the run-in.